Is it just me, or is there something missing in the whole “humans evolved as endurance athletes” story? To wit, here’s an interesting story from the folks at NPR. Interesting, no doubt – however, there’s an obvious (and, in my mind, at least) whole other half of the story that’s continually left unexplored. And not only unexplored, but seemingly unacknowledged. No doubt some humans are superbly suited for endurance endeavors; whippet-thin, slow-twitch dominant – all lungs, ligament, tendon and bone – and part of the problem here may be that the researchers themselves are, for the most part, (1) put together thusly, and (2) are themselves, endurance athletes. Confirmation bias, anyone? Seen through the prism of the endurance enthusiast, all of mankind is either a well trained, severely untrained, or badly trained, distance athlete. And sprinters? Simply a forced phenotypical expression (read ”ill-advised” and “ill-conceived”) that an underlying elegant and — quite natural! — endurance chassis must endure. Now, I’m certainly not a trained professional in this line of study, but this “endurance” line of logic just doesn’t resonate with me. Something, my logic tells me, is badly amiss. Of course, I could be accused of the same manner of confirmation bias in my own insistence that there also had to be an evolutionary niche for the powerful, sprinting human, a niche that “endurance man” simply could not fill. And, too, the idea of the “persistence hunt theory” – though no doubt part of the overall human evolution story – simply cannot be the whole, end-all of the story. These “sprinting types” peppered about humanity had to have evolved from a set of specific evolutionary pressures that had little to do with endurance and persistence, and more to do with swift, powerful and lethal. It seems to me that the energy expenditure to energy pay-off for persistence hunting (as defined in the “endurance” theory) has to be dreadfully low – even if we are to consider exceptional running mechanics. I have no doubt that in some niches that this was necessary – surely, though we co-evolved in diverse settings that required a diverse set of evolutionary skills. And possibly endurance evolved among humans, not for the purpose of persistence hunting, but for the purpose of scouting for the tribe? Think overall calorie intake for the communal band as a whole – women and children included — not simply a few runners and one (relatively) small, and no doubt lean, animal. A band of humans might more effectively and efficiently deploy scouts in numerous directions to locate promising hunting grounds and/or rich scavenging/gathering sources, allowing the tribe as a whole to find the best options within a large range. This method would, it seems to me, maximize caloric intake at a minimum of total communal expenditure, as the specialization within a group allows several to run for scouting/exploring purposes while the remainder can conserve energy for hunting (sprinting?) and gathering purposes once the most promising site has been found. Again, this is not to say that I dismiss the “endurance theory” out of hand, but simply to state that I know there has to be a “rest of the story” left to be uncovered. Simply put, I just don’t believe that the sprinting/power-inclined phenotype can be overlooked in an evolutionary sense, especially vis-à-vis the endurance path. Of course, this opens up the debate about genetics in sport; a debate that either focuses on the “endurance gene” (what makes Kenyans and Ethiopians so dominant?) or on the “speed gene” (West Africans, Jamaica and the USA). To be sure, it’s a debate that is heated, because it has anthropological, racial, cultural undertones. It’s a debate for another time, though, and a bit beyond the scope of today’s post. One thing that all runners benefit from though, is the superb spring/recoil characteristics of the foot structure. For more on that most interesting story, check this out. Ok, so in my humble opinion, not every human is naturally wired for efficient endurance endeavors, however, listening to Dr. Lieberman, though, would lead one to believe it so. I think I’ve established here that I have to disagree with the good doctor’s stance – I do, however, think that Dr. Lieberman’s choice in footwear absolutely rocks! 🙂 Now if he’d just give my power/sprint-inclined phenotypical brothers some well-deserved love, already! 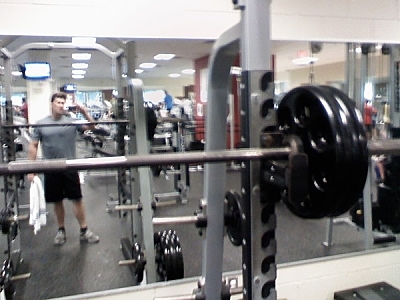 Then, following the superset, I continued on with the btn jerk, 200 x 5 rest-pause singles. The problem that I have to deal with here of course is the lack of bumper plates and a lifting platform. But, I do the best I can with what I’ve got to work with; that’s all any of us can hope to do. Anyhow, put a fork in me after this workout – I was damn well done. A well deserved and much appreciated off day is on tap for tomorrow; some light riding, maybe some barefooted strides, depending on the weather. At University, I recalled the post-grad runners & cyclists doing studies on strength training… typical scenario: Take an enduro who hasn’t lifted before & give them 3x 10 reps to failure of leg press, leg extension, & leg curls for 10 weeks whilst still undertaking running or cycling, then conclude that strength training does not benefit endurance athletes. Of course these post-grad running & cycling researchers had never done a day in the gym themselves (and if they did, it was high rep, light weight to work on endurance) and had no intention of doing differently or learning how to construct a good lifting programme. They just confirmed what they knew… got published (the academic equivalent of getting your name in lights), end of story. My injection of strength training & sprints into the cycling world extends only as far as working with female cyclists. Women are more likely to be an open template than guys in my experience. Working with the track cyclists, the women would ask questions & be more likely to stick to the programme – provided they didn’t listen to their male riding mates, their dad’s who used to ride, or some old bloke hanging out at the track… all of whom would tell them “you aren’t doing enough miles girl… you need to get some miles into the legs”. Working with guys – particularly young guys, was very frustrating. They would always want to train their BBQ muscles (big guns are important when you are in a tight lycra top), always want to know what they could take (legal or otherwise) to give them an edge, or spent far too long on the net looking for what everyone else was doing without looking at the bigger picture or wanting to do the flash stuff without sticking to the basics. I don’t want to hijack your thread, but whilst on the subject of track cycling sprinters, we always had a problem here in NZ in that our junior sprinters, as soon as they showed a bit of talent, they were given an extensive road volume programme and just had all their type-2’s ridden out of them! In looking at this, there was some suggestion that, provided the rider had not engaged in much in the way of endurance training through their early teens, their default fibre-type setting was toward type-2. My most successful rider had only ever engaged in ballet, sport aerobics, and strength training, and didn’t do any extensive volume rides over the winter months. Those riders who did would end the summer racing with a fair degree of speed, spend the winter losing it, and then have to spend the spring & summer trying to regain it. The powers that be couldn’t understand why our top riders times would just become static year after year. Of course, 2-3 years after not gaining in performance, they were dropped & they would move on to the ‘next big thing’. Craziness! Wow, great insight, Jamie – thanks for the thoughtful input. I think we evolved along the lines of both. I was walking though the zoo the other day and I couldn’t help but think if all these animals were let loose and I’ve got nothing but my wits to survive with: How would I do it? It would take some serious flight/fight skills and some endurance, strength and spiritual energy. That what makes the caveman, prehistoric man so interesting: How the hell did they survive the brutal conditions? Plus don’t forget the massive adrenaline dump: Couldn’t Usain Bolt run a little faster if a tiger was chasing him? Wouldn’t another world record fall? Big brain, small gut, and phenotypical plasticity, I think…this is the combination that “saved the day” for us as a species. I get tired just thinking about my former ‘endurance’ phenotype. I am currently reading a couple of books on tracking and stalking (of animals, but with some content on tracking humnas). The basis is on mental agility and skills; ‘reading sign’ and understanding your prey. The emphasis is on SLOW purposeful movement in pursuit of your quarry. If read carefully, you can anticipate your quarry’s next move and ambush/trap it. Also you can pursue it up close, with a requirement to move fast only in the final moments of the chase (and even this requirement is not necessary if you have long range weapons). Point being that you can hunt food of all shapes and sizes without having to do 30+ minutes of steady state jogging on a daily basis. But you will have to butcher it and carry the food back to camp. Given our predeliction for efficiency, I’d rather use my ingenuity to get my food rather than my ability to exhaust something to the point of death. “Stealth” was the word I should have emphasised! The “persistence model”, as we know it today, may be an outlier; this is what I’m inclined to think, anyway. I am inclined to agree. One of my earliest posts was in response to seeing a (stuffed) Woolly Rhino at my local museum. It was one huge animal. I started thinking about what would be involved in hunting one of these bad boys, and bursts of speed, throwing (stones, separs, nets etc…), all came to mind, but jogging struck me as being quite limited in its contribution to the ‘hunting exercise’ as a whole. Part of the equation, but only a small part. You certainly wouldn’t want to jog up to one (carrying your spear/hunting and butchering tools) and arrive in anything less than with a LOT of gas left in the tank. As an endurance junkie, I agree that scouting would have been an important aspect of endurance exercise. I can imagine some small number of people trotting up to the top of the ridge each day or so to check on herd migrations, look for smoke from wildfires or immigrating groups, etc. Certainly not everyone in the group would have needed to go out running every day. Still, I have a hard time believing that sprinting would have been all that useful as a tool for hunting or escaping from predators, except maybe from other humans. People would have had far more success guiding prey into a trap by group action than chasing it down in a sprint, again requiring prolonged trotting around, with a sprint or two thrown in occasionally perhaps. Soccer is perhaps a more appropriate model. You are right in my opinion that trapping and fishing etc could have also provided efficient means of acquiring food. Certainly persistence hunting would not have been the only method of hunting, especially since this seems to be most effective on open terrain and under hot dry conditions when humans can accomodate the heat but the animals cannot. But all parts of early Africa or Ice Age Europe would not have been hot, so this model may be limited. However, even making the rounds of traps set and searching for signs could be regarded as endurance exercise. I still think that what we consider endurance exercise would have just been normal everyday activity to early humans. As a soccer player, I second this. Some of the best players I grew up with knew one thing: How to walk a lot on the soccer field. They were awesome sprinters, but they were also awesome conservers. In short, they expanded their physiological headroom intuitively/naturally and spent as little time moving in the middle ground pace as possible. I just never stopped moving. I could’ve benefitted from some refined training with sprinting. Great insight. As a defensive football player — albeit, many, many moons ago 🙂 — I know that the best running backs that I played against were also the “laziest” between plays — slow to get up, a non-committal-like amble back to the huddle, lackadaisical, languid — until the following snap, that is, when they morphed into an instantaneous bolt of speed and quickness that lasted for the duration of the play (4 or 5 seconds? ), followed again by 30+ seconds of down time. Yeup: they were the “laziest” on the team. I guess it’s that “work smarter not harder” thing. It has some merit, at least. lol. You are so on the money on this. Humans evolved for both. Long slow walking for the purposes of foraging with fat acting as an energy source. And then you have sprinting and jumping and rolling and crawling for the purposes of hunting or avoiding deadly situations such as predators or rolling rocks or whatever using glucogen in the muscles and other organs for fuel. We definitely did not evolve for the purposes of long slow walking. Even if we did, I’d still run to my heart’s content. This serves as a great reminder that it is virtually impossible to pigeonhole something so broad into a category so narrow (“endurance athletes”). Quick thought on persistence hunting: Don’t you feel as though hunting patterns depended on exactly what was being hunted? Being that variables such as region determined diet, tribes naturally hunted/foraged different animals/food sources. Isn’t that reason enough to assume they also evolved differently? Agreed; different skillsets required to thrive under differing environmental pressures. In this case it is also useful to look at the innate behaviour of children. I have yet to see a child play ‘jogging games’! The only thing I’d say in Leiberman’s defense, and it’s something that I don’t think he or Chris McDougall emphasize enough, is that there’s a world of difference between the sugar-fueled-85%-aerobic-heart-rate marathon mentality of “endurance running” today and how our ancestors did it. In “Born to Run,” McDougall said that the Bushmen in Africa were doing 10 minute miles (a fairly easy pace by any stretch) with frequent breaks, short bursts of speed, and walking mixed in. Sounds closer to an interval workout than we might initially think. The persistence hunters didnt jog behind the prey. Its more like a fast shuffle with very fast sprints in between. Chronic jogging is no good in no ways. I mean, the best training even for endurance athletes is to sprint in different programmes 2 times a week, lift heavy stuff and do a lot of walking/hiking to train endurance in a more human way. thats my approach to it, and its a bit succesfull. In regard to human endurance, I believe this has much to do with mechanics and less to do with metabolism. Bipedal locomotion is so efficient, has such an incredible economy of motion that even a FT strength guy such as yourself could successfully persistance hunt….and be able to drag the animal out of the ditch when you’re done. Most evolutionary biologists do not believe in “group evolution” but I do. We evolved in hunter-gatherer groups that would benefit the propogation of any particular group member if there was a varying spectrum of metabolic and muscular capabilities. Oh, WRT your whippit example, google the term “bully whippit” or “Wendy the bully whippit” to see what happens when you delete this dog’s myostatin gene. What we hold up as the prototypical example of an endurance athlete actually performs much better at the races when they are heavily muscled…so much so that there is major controversy over these animals amongst racing breeders. Nice post. Non-trained folks have almost 50 percent of their muscle fibers as fast twitch. I will add another voice questioning the tendency to define humans as natural marathoners. As a long-time martial artist, I have spent a fair amount of time training both sides of the endurance/strength continuum. My personal experience is that I get a lot more bang for my buck training fast-twitch intervals than pounding the pavement: 2 or 3 intense sessions of anaerobic conditioning per week leave me able to last multiple rounds with more strength than I had as a cardio junkie. Also, when I do run, I don’t get out of breath as much or fall as quickly into the pattern of overly regular breathing. Absolutely. I’d train wrestlers the same way as well. The “kids don’t jog” argument bothers me. Obviously, kids run all the time – in fact, you could say it is their number one choice of activity. That children don’t naturally run distances in the modern world doesn’t tell you anything. They are not growing up in the evolutionary environment anymore. Historically, if the adult HGs were out there on persistent hunts, I bet the children would be itching to get out there. And there must have been some kind of coming of age, or rite of passage period as well. Maybe “chase” games centered around a persistence theme? I think you missed the whole point of Lieberman’s thesis on two counts. 1) He is comparing Humans to other animals, Usain Bolt is slower than a house cat. So while he may be a particularly fast man he is no where near enough to have caught his dinner in a sprint for the past 2 million years and we would never have made it. No one feeds you for being faster than the rest of your species. 2) The idea of exercise for appearance sake or sports is a newer phenomenon. People who live off what they hunt and gather as we all did not too long ago, evolutionarily speaking, were all what you would call whippet-thin endurance types. That doesn’t mean that they trained for marathons, they ran what ever way caught their prey sometimes a sprint sometimes a walk. Body types are largely determined by exposure to stimulus and environmental factors. Would Lebron James(with alleged genetic advantages) have the body he does if he had devoted his time to pies instead of athletics? There is one thing most overweight people share, a lack of HIT.. and an environment that promotes overindulgence. Obesity has not hit the slums of somalia yet.. Speaking of pies, almost every culture has some variation.. would this make pies a part of our genetics?